Beef cuts and how to best prepare them for easy low carb meals. Buying beef cuts can be confusing for the average cook at home. So here we’ve listed the various cuts and how to best prepare them. As a general rule, long slow cooking will take the toughest meat and tenderize it beautifully. If you’re cooking the meat quickly, like broiling or frying a steak you want to be sure the finished product will be tender and not come out like shoe leather! Here’s what works to tell you if the meat is going to be tough or tender. Let’s say you’re rooting through the freezer and you notice a frozen steak but the label has fallen off. So you have no idea if it’s going to cook up tender or tough. When the meat has thawed, pinch it. If it’s not really giving in or it feels bouncy, then the meat will be tough. If it can easily be squashed it will be tender. It’s just too bad we can’t do the pinch test in the store before we buy! 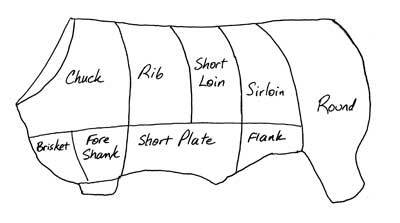 This is a really simple diagram to show you where the various beef cuts come from. And below you will see that I've made a list of all the cuts and indicated the best way for preparing them. Of course, we’ll soon have some great recipes to go along with some of our favorite cuts of meat. I do hope you found this information useful. And by all means, visit the site to find great low carb beef recipes. Return from Beef Cuts to Home page.